“Induction of Little Boy” depicts the power and authority of an atomic bomb, more specifically the atomic bombing of Hiroshima. 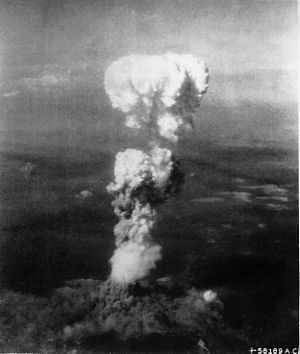 The atomic bomb, named “Little Boy,” that dropped on Hiroshima forever changed the history of Japan in 1945. The aftermath left devastation of the city of Hiroshima, the local population, and their national identity in its wake. Not only people were harmed from the blast itself, the radiation affected thousands of people with some ending up with cancer. The cranes allude to the story of the girl and the 1000 paper cranes, attracting inspiration and sympathy simultaneously. The surface mimics the dilapidated walls of the buildings that fall within the blast radius. Patterns near the bottom come together as an urban environment as the top patterns reflect the fiery sky exhibited at the time of the bomb drop. Drips also accompany the background, representing the poisonous black rain produced from the radioactive chemicals that gave many thirsty people false hope. A drawing done by a survivor at Hiroshima. A drawing done by a survivor at Hiroshima. The mushroom cloud.